Looking Good, Smelling Good, Feeling Good! Our Soothing Day Spa offers many varieties of bathing services. 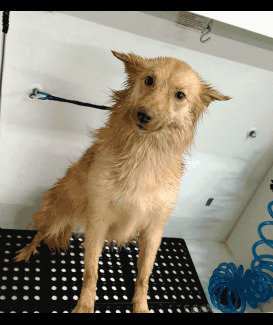 Along with our excellent grooming staff to give your pooch a top-rated grooming experience, we also offer a variety of shampoos: hypoallergenic, natural organic, and non-scented. 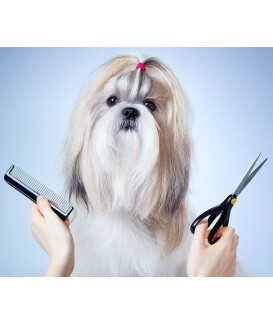 Our grooming staff offers de-matting, for those challenging bad-hair days (we've all had them), brush outs and any customized grooming services. Also now available our SHED-LESS process - leave all that excess hair in our bathtub, not yours. This process really gets beyond just the top coat and into the undercoat portion of the fur. Manicures and pedicures are always available as well. Remember we are here for you so please be sure to inquire with us about your dog’s needs. See our basic pricing here. Owners will be required to provide proof of current vaccinations (Bordetella, Rabies, DHPP and K-9 Flu). Flea and heart worm preventatives are encouraged but not required. This should be discussed with your veterinarian. We also support and encourage Titers blood test for all dogs as an alternative to proof of vaccinations. 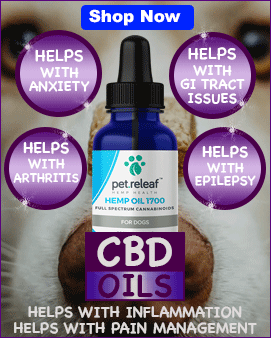 Call for more information or to set up a spa day for your best friend! 530 342-WAGS (9247). Make an online reservation here. Shed-Be-Gone process - leave all that excess hair in our bathtub, not yours. This process really gets beyond just the top coat and into the undercoat portion of the fur. This process must be combined with a Shampooch. Call today 530 342-9247 or fill out our On-line Form to book your furry best friend a Spa day. Bath, Blow-dry, Brush-out, Ears Cleaned & Nails Clipped. Must call 530 342-9247 or fill out our On-line Form to book your Spa day for your furry best friend. Bath, Blow-Dry, Brush-out, Ears Cleaned, Nails Clipped, and of course hair is cut. Our excellent groomer will discuss with you exactly what kind of hair cut your looking for. To make a reservation call today 530 342-9247 or fill out our On-line Form to book your furry best friend a Spa day. Sometimes the only way to get rid of mats is to have them cut out. 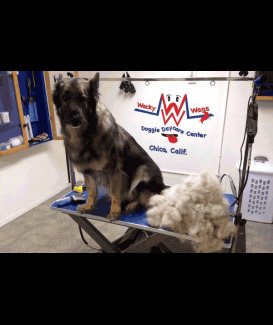 Let our groomer brush and cut those nasty mats away. If she does cut them out she does a wonderful job of layering the fur to look as natural as possible. 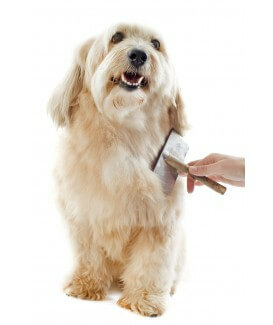 Call today 530 342-9247 or fill out our on-line form to book your furry best friend a Spa day. Nail Trimming. 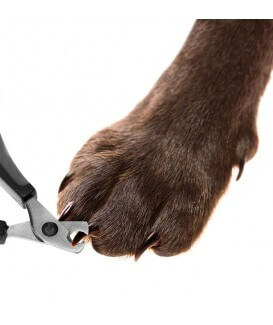 Wacky Wags uses a rotary tool or hand clipper. We let the dog decide which method they prefer. To make a reservation call today 530 342-9247 or fill out our On-line Form to book your furry best friend for a nail trim.